- This is on whether the appointments of FMSS and FMSI and the payments totalling $33.7 million to FMSS and FMSI were improper. - KPMG Report concludes that “detectable” improper payments by AHTC to FMSS and FMSI amounts only to $1,518,286. - On cross-examination at the trial, KPMG auditor Mr Hawkes said that even when KPMG identifies a payment as improper, they are not necessarily recommending that they ought to be recovered. This is because for some payments identified as improper, it is not possible to determine what part of them could be labelled improper and ought to be recovered (therefore “not determinable” in KPMG’s table attached). - Thus, Mr Hawkes clarified that of the $1,518,286 identified as improper, KPMG concluded that only $624,621 ought to be recoverable. 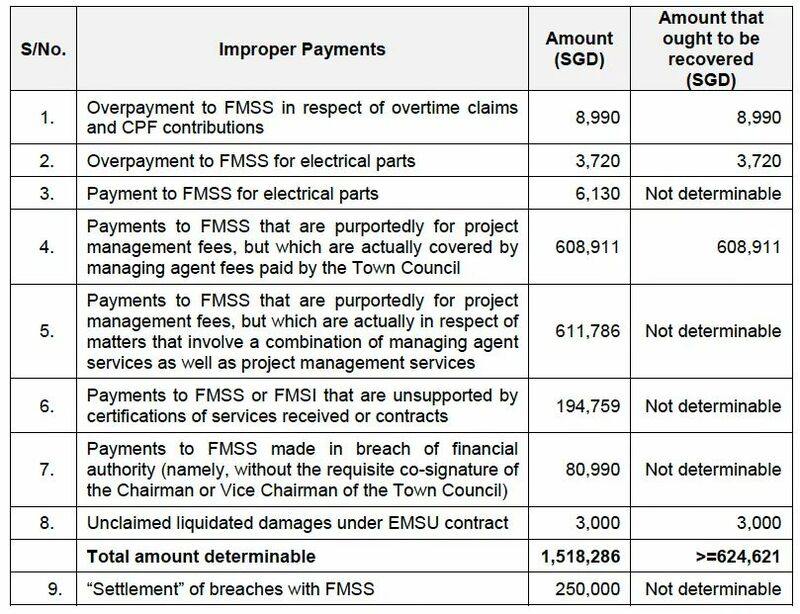 - Further, the bulk of the sum of $624,621 comprises the project management fees of $608,911 under the contract with FMSS, which the Defence argues ought to be excluded because it is not improper. The remaining sum that ought to be recovered is merely $15,710. - Nowhere in the KPMG Report or the PwC Report does it state that all of AHTC’s payments to FMSS/FMSI totalling $33.7 million is improper and therefore ought to be recovered. * Facebook post by Daniel Goh. Tell them to recover Ahtc constituency………….that is improper for them to lose it? We in Hougang are enjoying this drama held by the Pappies. More will come after Cheng Bock is elected. This is what the army called roadshow! So after all the damn huha about improper payment by WP, ONLY $15,710.00 need to be recovered and NOT $33.7 millions. Mai Hum is REALLY damn SNEAKY. Spending taxpayers monies FIXING the WP just to recover $15.7k. How about the tens of $millions that were lost by his fiacking TCs purchasing toxic Mimi bonds on the quiet during the collapse of Lehman Brothers in the 2008 GFC? No sound to inquiry. All his fiacking MPs macham like church mice..hear and see NO EVIL! All clean as babies! Holee shits. This post should be publicized. The bad impression created by those out to run down WP needs to be corrected. Both in the Social Media and in the current trials. This figure is peanut comparing to billions we will recover after next GE. Why AIM such a big elephant can escape? Maybe Yatima Jusoff can starts to reflect from here why people are angry. It seems that someone, in his eagerness and viciousness to fix the Workers’ Party, has gone over-board to the extreme without examining in detail nor sort clarification with the auditing firms thoroughly, before wasting the court’s time and making a fool of himself. citizens knew all along clown pap is trying to FIX WP in Aljunied. notice how quickly citizens supported the fund seeking of Ms Sylvia Lim, et al.? clown pap balls shaking when he saw the support. moreover, FIXING of WP does not mean can be successful since the FIXING is a lie to begin with. there is a limit to how much clown pap can lie in 70% sheep land. up to a point the tide must turn, for the better of OPPOSITION alliance. mouthpiece’s headline in the first report read…. The WP MPs PLOTTED to…. some of the readers here might not be fans of the WP but just spare a thot….if it was another oppo party that was involved in the saga, the bias and damaging headline will still be the same or even worse. laugh and armchio as much as you like seeing WP is now in trouble….if for example it was SDP, PSP no mercy will also be given by mouthpiece..
the damand for 33 million is outrageous….hidden agenda? kana bankrupt and disqualified to be MPs and cannot run for the coming GE? Bloody hell, the government wasted millions of dollars for legal fees to recover $15,000? The people of Aljunied need to sue the government to recover the wasted legal fees! Every TC MUST BE TRANSPARENT. I am cocksure the PAP MPs have had n still have PLENTY FOR HONEST DISCLOSURE. As a starter ALL TOP PUBLIC SERVANTS SHOULD DECLARE THEIR NET WORTH BEFORE M AFTER THEIR TENURES OF OFFICE. INTEGRITY N TRANSPARENCY ARE INSEPARABLE. WITHOUT REAL TRANSPARENCY,THERE CAN BE NO TRUE INTEGRITY. We saw rats running about in AMK,didnt we? Typical Bastards…making MOUNTAINS out of MOLEHILLS!!! The “ART” of “twisting and playing” on One’s Mind ! Not letting you know that Flierfly which was involved in the “BIG HOO Ha” on the landing system and the use of airspace ,…was and actually “had links to Rosemati and Narji ,would certainly go a long way in “preventing” people from having “further wild imaginations which may lead to thoughts of some “hanky panky business” happening behind the scene. The ” UNNECESSARY or cunning ways of highlighting” of the sum $33 million being improper is also a way of “twisting and playing” on one’s minds to “poison” the image of the Opposition ! If you have “associates” that “does work or behaves like that”…ie, using “selective info or twisting info and playing” your mind,…better watch out !!! !……this is a “Snake”,…a very “Cunning Snake” indeed ! My advise…stay away and avoid them !!! If i am not mistaken,….this “planned sabotaged ” has already “claimed” the life of an innocent “victim” ?? ?….something like he fell and died while in japan . Pimps and prostitutes, (p.a.p. )… certainly have no mercy.! Play “dirty”,…act “dirty”…All over a “fight for absolute”,..POWER,$$$ and sax…. 15,710 over 33,700,000 is 0.0466% – not at all material as most accounting rules anywhere in the world other than clown pap is at 5%. clown pap FIXING of WP utter fail, as it should be because the FIXING is on a fake news premise of 33,700,000 when it is an arguable 15,710 – arguable because in the scheme of things, a little over payment here and there is situational and cannot be faulted. why clown pap NOT fixing AIM instead? or the brompton bikes? cannot. otherwise slapping own face. ha ha ha. WTF this lky clown. Walao eh, spend millions on lawyer fees for 10k? These politicians are so damned smart manz! When is the government going to recover the over $m rubbish center? KNN everytime never publish my comment. Kiasi. PAP Biws ve nothing better to do yet the number of ministers is increasing with PMO having a majong team. As many Singaporeans r seeing these bloody overpaid super corky though thry have traded their to po other just to chalk up enough points to getvwhat they xant at public expence. LKY said any citizens ke sworn to serve not with him o his policy r his enemies. Citizens of Singaporeans should treat all the super arrogant egoistic self gratifying n self glorifying badtard who defy Jesus, Mohammed n Buddha for not abiding his vow on their Holy Books n worse betraying them n the nation as nztional enemies n traitors n should spare nothing to eradicting them from the island once a beautiful homeland but now raped by these bastards. .Get them out of Parliament, sealed them in till citizens concertedly exposd what have they have done in the dark. n feed them what they deserved. This case is clearly, undeniably, triple-confirmed politically motivated. It is nothing but a slimmy, cunning, atrocious political manoeuvre designed to put the Workers’ Party out of business. It is political persecution at Work. The Judiciary is being made use of and whether it works again, is yet to be seen. Evidence to substantiate? Use your brain, if you have a functioning one. 1. Who benefit mosts in any/all aspects if Workers’ Party is found guilty and punished till pants drop? 2. Who brought the charges to the Judiciary? 3. Who is the Boss in-charge of Pasir Ris/Punggol GRC? Answer: None other than DPM Teo Chee Hean. 4. Who is Teo Chee Hean? Put two and two together, and you get the ANSWER.